No. 317 April 2019 l Red Nose Day brought fun and games to the area and youngsters such as these in Melbourne (right) and Ticknall did their bit in aid of Comic Relief. Report and more pictures inside. being looked at. Parish councillors were also told that a regular market that was being held in Willington had now ceased trading, after shopkeepers said it was too successful and they were getting none of the benefit – potentially creating further opportunity in Melbourne. Proposals for a market in Melbourne were discussed last year when representatives from the district council and Swadlincote market came to a parish council meeting to put forward the idea. They said that the market in Swadlincote had done much to boost economic vitality in the town with increased footfall on market days bringing a boost to local shops as well as traders. DOVES VE ES Gar Ga ara rag age geses Lt LLtd ttd. tdd. CCTV footage gathered in Melbourne has, for the first time, seen a dog owner fined £100 for failing to pick up their animal’s poo. 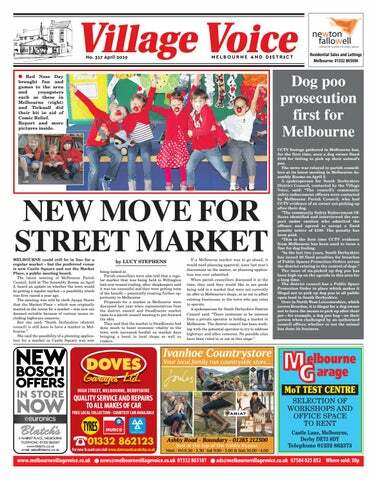 The news was relayed to parish councillors at its latest meeting in Melbourne Assembly Rooms on April 2. A spokesperson for South Derbyshire District Council, contacted by the Village Voice, said: “The council’s community safety enforcement officers were contacted by Melbourne Parish Council, who had CCTV evidence of an owner not picking up after their dog. “The community Safety Enforcement Officers identified and interviewed the suspect under caution who admitted the offence and agreed to accept a fixed penalty notice of £100. The penalty has been paid. “This is the first time CCTV evidence from Melbourne has been used to issue a fine for dog fouling. “In the last two years, South Derbyshire has issued 20 fixed penalties for breaches of Public Spaces Protection Orders across the district relating to the control of dogs.” The issue of un-picked up dog poo has been high up on the agenda in this area for a long time. The district council has a Public Space Protection Order in place which makes it illegal not to pick up dog poo in all public open land in South Derbyshire. Over in North West Leicestershire, which covers Breedon, it is illegal for a dog owner not to have the means to pick up after their pet – for example, a dog poo bag – on their person when challenged by an authorised council officer, whether or not the animal has done its business. l The substation on Quick Close (“much better than it could have been”) and guerilla gardening on Jubilee Close/Station Road (highly commended). ALL the money due to the local community associated with the new Victoria Gardens development on Jawbone Lane has now been paid, the Village Voice has learned. A sign outside the Miller Homes development said £274,000 would be due to the local area, to be paid to various bodies including both schools, the GP surgery and the sports park. The money is paid under ‘section 106’ terms, which is paid by developers to communities to mitigate the impact of extra housing on local services. A spokesperson for South Derbyshire District Council, which is responsible for handling section 106 payments, said Miller Homes had actually paid slightly more than first indicated. They said: “ … the figure Miller Homes has paid in contribution for Off Site Open Space is approximately double that displayed. This is because of the original intention by Miller Homes to increase the Open Space provided on site which would have lowered the requirement for an off-site contribution. The “off-site” open space contribution is being paid to Whistlewood Common. Alistair Parsons, area sales director at Miller Homes Midlands, said: “At Miller Homes, we believe in building much more than quality homes – we’re committed to creating communities that are safe, welcoming and built for the future. We know that our contribution will continue to make this village a desirable place for residents to settle for years to come. “We are delighted to confirm that we have officially completed our funding towards the village of Melbourne, Derbyshire, contributing over £313,535 towards education institutions, sports facilities and a medical practice.” The district council has a formal claim process for the beneficiaries to claim the money collected on their behalf. The section 106 officers can be contacted using the following email address s106@southderbyshire.gov.uk and Application of Monies Forms can be sent out. The council has said it has already been in contact with the relevant groups in this case. Now taking day boarding dogs which includes socialisŝŶŐĂŶĚŽīůĞĂĚĞǆĞƌĐŝƐŝŶŐŝŶŽƵƌůĂƌŐĞĞŶĐůŽƐĞĚ paddocks. l Members of the carnival committee are Rachel Hill (new chair), Gemma Betteley (secretary), Christian Peat (treasurer), Penny Mitchell, Sarah Stainthorpe, Emily Starkie, Tim Margett, Rhona Kirkham and Rebecca Stead (not photographed). flowers from Melbourne Florist and plenty of coffee and cake from Forteys and Jacks! Business has already been done between our group and Melbourne-based SMEs. “Apart from pretty much all of us coming away with bags from the interiors’ shops on the day, we now have members commissioning services from Melbourne businesses including Melbourne Print and the Melbourne Assembly Rooms – plus one member is even looking at property for her family here! “I think you can safely say we have been inspired by Melbourne; we had no idea it had this much potential! Thank you for making us feel so welcome.” Firm Support is there to help female entrepreneurs facing challenges in their journey to success. It aims to provide a professional, supportive environment to sharing best practice, individual expertise and a confidential environment. l Members of Firm Support with chair, Rachael Brown, third from right, on their visit to Melbourne. those planted near footpath seven next to the development are now in a poor state, some having actually died, after being exposed to the Beast from the East storms last year. Barry Thomas, from Melbourne Civic Society, said: “We would like to make sure that any dead trees are replaced.” Planning conditions include maintenance for trees as well as planting them. Sheringham Park is famous for its wonderful collection of Rhododendrons. This short break returns at the request of our customers, staying at the luxurious Sea Marge hotel, near Cromer on the North Norfolk Coast. Some of England’s most famous painters were inspired by Suffolk’s picturesque villages and unspoilt coastline, and it’s easy to see why. APPLICANTS who wanted to put a six-pitch gypsy caravan site in Aston-on-Trent have now appealed against the decision to refuse their proposal – which means it is up for scrutiny again. Last October, around 250 people from Aston-on-Trent turned up to South Derbyshire District Council’s civic offices in Swadlincote to hear the decision as to whether the proposed gypsy site on Shardlow Road would be granted. Only around 40 could actually fit into the debating chamber and the rest had to wait outside. Officers had recommended the site should go ahead, but members of its planning committee spent an hour carefully debating the ins and outs of the matter, before voting to refuse it by a narrow margin. The applicants have now appealed against the refusal, which means it will be looked at by a planning inspector, who is able to overturn the original refusal – or agree with the decision councillors made. Gail, Harry, Charlotte and family would like to thank everyone sincerely for all the cards, flowers, messages of support and kindness since losing Dave and for attending the service to celebrate Dave’s life. £1,345 has been donated in Dave’s memory and this will be used to buy fans and radios for patients to use on the Adult Intensive Care Unit at QMC Nottingham, together with comfort items for the visitors’ waiting room. Thank you all for your generosity We would also like to thank Rev. John Hartley for supporting the family, conducting the service and for delivering a wonderful eulogy for Dave. Thank you to everyone at Melbourne Methodist Church for all their thoughts and prayers. Thanks to Andy and all at JP Springthorpe & Co for all their care throughout. Finally we would like to thank Emma Stanley for the superb buffet and Yvonne and everyone at Melbourne Royal British Legion for looking after us at Dave’s “after party”. THERE is still time for individuals or groups to come forward with a plan for running Melbourne Library. An open day at the library, on March 14, saw a steady stream of individuals asking questions. A detailed information pack was also made available to anyone interested. Although there is no set timetable for handing over to the community, officials advised that expressions of interest will need to be lodged by April 11.
could be run for the benefit of the local community in the future. “There’s still time for people, groups and organisations to register their interest in running Melbourne Library as the deadline for responses is April 11.” There is still no clarity about the future for the staff working in the libraries being transferred to community ownership, nor on what will happen if no suitable groups come forward. alive. We did lose several of them and had to foster some calves off the last of the dairy cows, which is never an easy job. Some cows will take to any calves and some just will not have them at any price. We have an old dairy cow that’s been on the farm for more than 14 years and has had 11 calves of her own. She will take to any calf and plays hell if you try to take it off her. n Last week our cattle passed their biannual TB test which is always a great relief. Some areas of the country which are more densely populated with cattle are continually losing stock to this dreadful problem. Our local area has a much smaller population and very little nose-to-nose contact with neighbouring herds. Deer, badgers and other animals pose a risk of spreading TB to cattle herds, but we can only suppose that our wildlife is clear of the disease too. Long may this continue. Our Solicitors will guide you through the process and advise you on the best structure of a Will relating to your circumstances. Protect your Assets and your Family. STORM Gareth may have wreaked havoc on much of the UK, but a pair of Little Owls were still able to find shelter from March’s high winds in an old oak tree at Calke Abbey. Little owls are the smallest type of owl found in the UK, and numbers have been rapidly declining in this country over recent decades. These pictures were taken of one of the Little Owls in the grounds of Calke, whose gnarly old oak trees make an excellent habitat for them. These trees are also used by woodpeckers and nuthatches which feed off them, as well as deer, badgers, cattle and sheep which use the oaks for feeding or sheltering under. THIS year marks the 15th anniversary of the Melbourne Festival – and the artistic festivities are set to have a distinctly “flower power” theme. Following the popularity of last year’s Pop Up Poppies to mark the end of the First World War, for which Melbourne’s knitters made more than 7,000 poppies, members of the public are being invited once again to show off their crafty side. They are being asked to join in with knitting or sewing brightly coloured flowers and bunting made from leftover fabric scraps and wool to decorate the trail. Festival director Sharon Brown said that the team organising this year’s event were keen to create a party atmosphere – and, while it was not quite going back to the 1960s, ‘Flower Power is in the air’. She said: “Spring has sprung and Melbourne Festival’s plans are galloping ahead. Fortunately, the festival is still going strong and it’s hard to believe that this is the 15th year! “Planning started after Christmas and, as usual, the festival has BIG ideas and a small budget – the current challenge is how to make it all happen!” This year’s Art & Architecture Trail will be held on September 14 and 15. In the lead-up to the festival, local children will be invited to join in free workshops as part of this year’s ‘Rumble in the Jungle’ theme. Adults will also be encouraged to join ‘Crafternoons’ to sew or knit the flowers being used to decorate the trail. Live performances have always been part of the festival and this year they are being rebranded as Melbourne Festival Fringe. Over the last few years, more local organisations have arranged events in September and October – anyone who wants to find out more about arranging a fringe event is advised to contact with the festival team. Sharon said: “Melbourne Festival is not for profit. Ticket sales nearly cover the cost of putting on the trail but not the extras for children, young people, and the not-so-young. “The festival gets no financial support from the district or parish councils so it needs support from local companies and individuals to help pay for workshops etc. “The festival really appreciates their support as it enables local people to take part in creative activities and helps keep the festival fresh. “If you would like to support the festival by becoming a sponsor or a ‘festival friend’ please contact the festival team. Sponsors and friends get free entry to the trail, plus early access to concert tickets and regular newsletters. The festival needs your support.” Anyone who wants to help out with creating flowers is asked to get in touch with the festival on 07765 819428. You can also find out more by popping into Melbourne Community Care’s office, or joining the team for a Crafternoon Tea on Thursday afternoons at Pool Cottage from mid-May. 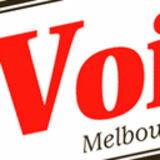 Look out for updates on the festival at www.melbournefestival.co.uk and in the Village Voice. POLICE are asking if anyone saw any person or vehicle “hanging around” on Jubilee Close or its nearby streets on March 27 after an attempted burglary on a property there. The burglary happened between 6.30pm and 7.15pm. Police said a rear window was forced open and the offender or offenders got inside and searched the place, but nothing was actually stolen. Please call 101 quoting 19*156462 if you have any information that could assist with inquiries. n THIS year’s Melbourne Quiz saw the Capulets crowned the winners … but they were from slightly nearer home than fair Verona. Local drama group St Michael’s Players fielded two teams for this year’s popular quiz, of which the other was The Montagues. Sunday 26th, May 11am -4pm Come and browse an array of stalls selling a selection of goods. NINETY years young and the life and soul of the party – that was Melbourne’s Betty Baker as she celebrated her big birthday surrounded by friends and family at Melbourne Hall Tea Rooms. More than 40 people turned out to celebrate Betty’s 90th birthday on March 30, her birthday itself being a few days later on April 2. Born in Melbourne into the Laban family, Betty went to school locally and then won a scholarship to Parkfields Cedars. After leaving school she went and worked at Melbourne Telephone Exchange. Marriage to Maurice Baker took place in 1949 in Melbourne, and the pair ran the Ferrers Arms at Lount for six years in the 1950s, before returning to the village. Betty’s party in the tea rooms had one very special guest: Michael Bishop, chairman of British Midland Airways, for whom Betty worked for 24 years. Betty said the tea rooms had catered brilliantly for the party: “They did a very good job, they were brilliant,” she said. Betty (seated, centre) is pictured withh grand-daughters Emma Ireland, Laura Baker, Rebecca Baker and Louise Blood and great grandchildren Alfie and Lily Ireland (right). supply for the estate’s gardens, it is understood that water would originally have been delivered to a water tower in the courtyard from where it would have been taken to the fountains within the garden. It was also used to supply water within the main castle building itself, using an ingenious system involving a water powered lift to service rooms at different levels within the building. But the later decline of the estate meant the removal of features served by the pump house, with the water tower demolished, the fountains removed and the walled gardens abandoned. The lake was also allowed to silt up, which affected the operation of the pump mechanism. The heritage statement said: “The building is vitally important to the gothic fantasy landscape designed by William Barron at Elvaston, and, as the first of three similar garden buildings it is considered to be of great physical evidential value in the development of his ideas within this collection. Indeed, the building bears the family crest – which is surely a testament to the endearing relationship the Stanhope family had with their garden and the buildings within it. It is, therefore, of considerable importance that the building is conserved for future generations to enjoy.” The proposals are currently with South Derbyshire District Council where they are awaiting a decision. Use the Village Voice to advertise your business to thousands of potential customers. www.wagtailstorage.co.uk Tel: 01530 222179 TOP: Yvonne and Clive Karusseit with Yvonneâ&#x20AC;&#x2122;s mother, Eileen Ford, and their Staffordshire Bull Terrier, Duke, pictured in their garden in Melbourne, on Cliveâ&#x20AC;&#x2122;s birthday. ABOVE: Members of the support group celebrate the good news. APPLAUSE rang out at a Melbourne Parish Council meeting in honour of a much-respected councillor who made his â&#x20AC;&#x153;swan songâ&#x20AC;? following 20 years of public service. Honorary Alderman John Harrison, who has decided not to seek re-election to the district council this May, gave his last report to the parish council at its latest meeting on April 2. District and county councillors provide updates to parish councillors every time they meet, and Alderman Harrison said this was his last one having done the job for two decades â&#x20AC;&#x201C; both as a county and district councillor. He is particularly well known in this area for having been instrumental in bringing about Melbourne Sports Park, of which he is now honorary president. Speaking to the parish council, Alderman Harrison said: â&#x20AC;&#x153;This is my swan song â&#x20AC;&#x201C; the first song I made to this council was a full 20 years ago. During that time Iâ&#x20AC;&#x2122;ve done my best to advance, promote and protect the interests of this wonderful town. â&#x20AC;&#x153;Iâ&#x20AC;&#x2122;ve enjoyed most of that time. I havenâ&#x20AC;&#x2122;t been successful in everything Iâ&#x20AC;&#x2122;ve been engaged in; hopefully on balance Iâ&#x20AC;&#x2122;ve done good things rather than things that are detrimental to the local community. I wish my successor every success.â&#x20AC;? Alderman Harrisonâ&#x20AC;&#x2122;s words were greeted with applause. Parish council chair Sheila Hicklin told him: â&#x20AC;&#x153;On behalf of myself and the rest of Melbourne and Kings Newton, as a district councillor and a county councillor, youâ&#x20AC;&#x2122;ve been amazing!â&#x20AC;? TEXT MESSAGING SERVICE To try and reduce the amount of clinical time lost due to missed appointments and late cancellations, the practice is now offering a text messaging service. Any patients who wish to receive these will need to complete a text messaging consent form, available at reception. Please note, we cannot offer this service unless a consent form has been completed. Naomi Fry BDS & Associates, Helen Baker BDS ● Family Dental Care using latest techniques and materials ● Friendly and caring service ● Cosmetic Dentistry including tooth whitening Naomi Fry accepts child orthodontic patients on the N.H.S. n AN afternoon tea fit for a queen raised £750 towards this year’s Well Dressing Festival in Aston-on-Trent. The annual well dressing festival is happening on July 6 and 7 and this year’s nominated charities are SAVE (Save Aston Village Environment) and Aquabox, a charity and community project set up and managed by the Rotary Club of Wirksworth to provide safe drinking water, through the use of filtration units, and humanitarian aid to crisis zones around the world. The new well dressing committee put on the event, with lots of new stalls, a tea party, and fizz. “ You Get The Most Thorough Clean Ever Seen Or It’s Free”! That’s right, the most thorough cleaning ever. My carpet and upholstery cleaning is the best and most thorough you could ever have – if you don’t agree I won’t accept your payment. Along with the purchase of your home and family car, your soft furnishings are one of the largest investments you will make. Professional cleaning of your furnishings on a regular basis will extend their life considerably as well as keeping them hygienic and looking good. 4 Reasons Why You Should Choose My Company To Clean & Protect Your Family’s Health 1. Thorough Cleaning – My method doesn’t leave any residue or cause shrinkage. It cleans down to the base of your carpet removing harmful bacteria leaving your carpet clean and healthy. 2. Honest Pricing – I promise no high-pressure sales gimmicks. The prices I quote you are fully inclusive of cleaning products and labour. A full complete clean AND no hidden extras. 3. Protection of your soft Furnishings - Your valuable soft furnishings will stay cleaner longer, vacuum easier and have improved stain resistance with our carpet and upholstery protectors. 4. Long Standing Reputation – My company enjoys a reputation which is second to none, many of our customers not only come back to us time and again but recommend us to their family and friends. we had the weather on our side. “We employed extra pairs of hands to support our regular workforce and additional specialist equipment and materials. “This helped us speed up repairs so that we can get our roads and pavements in a much better condition as quickly as possible. We also put in an extra £6m investment in our roads to help keep on top of defects.” Of the money spent, around £800,000 went towards fixing potholes; £500,000 to resurface paths; and a further half a million on drainage works and resurfacing to cut down on the future maintenance bill. HARD-WORKING volunteers at a former brickyard in Aston-on-Trent have been rewarded for years of effort after news that the site looks set to be designated a local nature reserve. Local group Friends of Aston Brickyard (FAB) was set up and started working at the site back in 2012, with the aim of turning the former quarry into a peaceful wildlife haven. Derbyshire County Council, which owns the Derby Road site, said that the nature reserve recommendation was “… a tribute to the significant increase in the site’s wildlife value in recent years”. One of the site’s biggest success stories is the fact that, despite a decline in national butterfly populations, there are now 25 species of butterflies at Aston Brickyard, including the White-letter Hairstreak. Once feared extinct, the White-letter Hairstreak is still a “UK priority” species, with populations recovering in a few areas of the country. Natural England has recommended the site be designated a nature reserve after the county council applied for the status. l The entrance to the Brickyard site (above) with the White-letter Hairstreak (right) and (far right) decoration on one of the site’s trees. MELBOURNE’S new public toilets are still a work in progress … a public meeting heard. The latest meeting of Melbourne Parish Council on April 2 heard an update on progress to create the new loos on the village’s High Street, after the previous ones were shut last September. The meeting heard how the land that the toilets had been situated on was contaminated, which accounted for the delay. Barry Thomas, from Melbourne Civic Society, was present in the public section of the meeting where he asked whether there was any further news on the “eyesore” site as to timescales. Alexander Bruce Estates, which is doing the work for Melbourne, said they and their ground engineers were working closely with the district council to “ensure the redevelopment is completed in accordance with the latest remediation strategy”. For more information Tel: 01283 218528 NVQ preferred but not essential Own transport is required. STAFF … and a dog … from a local out for Comic Relief this year – or s The management team at the pubs r bourne, The Boot of Repton and The Dr idea of rolling a barrel of their own-bre 7.2 mile trip from Melbourne via Tickna The stout was brewed by head brewe pint sold – along with individual sponso lief. “The epic trek took place on March 15 his valuable support. The team set off from Melbourne, qu involved in getting to Ticknall, and on a landlord Tony, who was ready and waitin tomers raised £162 for the Comic Relie The Boot in Repton, where they had lu very glad to see the welcoming sign of T Once the beer had been sold over th £1,187 with Kelly Jennings, Bespoke’s personal sum of £360. Meanwhile, local schools got into the s ing in red, wearing onesies to school, spl other fun. At Dame Catherine Harpur’s School lasted all week, culminating on March 1 As the school welcomes many families one or two days a week, staff were kee with the fundraising. There was a different theme each day “onesies” day as well as “wear red” day. Over in Aston-on-Trent, the primar spokesperson said: “We were overwhelm nity raising money for Comic Relief, and coffee morning. Together we raised alm class were amazing helpers; greeting cu taking orders, bringing pupils from clas were attending, and waiting on the tabl At Weston-on-Trent Primary School, c day in return for a £1 donation. In the day the whole school came together and formed friendship raps. In Melbourne, pupils at the infant sch than £200, while at the junior school m dressing up in pyjamas, onesies and enj portunity to throw wet sponges at memb doesn’t enjoy that? Ƥ inc inc ncl cluding u : The Greatest Showman, Ma amma Mia, Les e Miser i errab ise a les, The King and a I, I Th The Soun ou u d off Music sic icc.. ... Something for f everyone. l Staff from Bespoke Inns preparing to set off on their barrel roll. LEFT: Children in their Red Nose Day outfits and telling jokes at Westonon-Trent Primary School. RIGHT: Aston-onTrent Primary School’s coffee morning. We are a ffriendly establishment located on the outskirts of rural Melbourne bourne off offe ffering ering comf omfo for o table, secur ure re accommodation, daily exerrcise sessions, playtime and love from our knowledgeable and experienced staffff.. We welcome dogs and cats of all breeds and sizes and invite owners to visit by appointment to see our facilities. l Melbourne Junior School pupils (above) in their pyjamas and (below) Melbourne Infant School children dressed in red. Drawing and painting days at The Ferrers Centre for Arts and Crafts. l Dame Catherine’s pupils dressed in onesies. Where to put noise monitor? A PERMANENT noise monitor helping East Midlands Airport measure how much local people are affected by aircraft noise is still on its way to Melbourne – now a decision has to be made as to where to put it. The latest meeting of Melbourne Parish Council heard that the equipment in question would measure 15 by 20 foot, with an 18-foot high mast on the top, and that it would be here permanently. Parish council chair Sheila Hicklin said: “Because of the size of it, we’re back to square one to find somewhere suitable in the village of Melbourne that we could put a permanent structure of that size.” The meeting heard confirmation that planning permission would be required for any noise monitor in Melbourne. The monitoring equipment is part of the airport’s commitments under its Noise Action Plan. tomers’ phone numbers obtained from photocopied BT directories. Derbyshire County Council’s trading standards became concerned about TDM in 2015 and said that, despite advice and visits to the company, complaints continued, and carried on when IDST started trading in August 2016. Customers believed they were dealing with vacuum cleaner manufacturer ‘Dyson’, and there were reports spare parts paid for in advance were not being provided. The three were prosecuted by the county council’s trading standards department after a long investigation. Each faced one charge of fraudulent trading, which related to dishonestly claiming to customers that the £14.99 service price they offered was a discount when it was actually the standard price. Sales staff employed by the companies claimed that £40 was the normal price for a service but no-one was charged this. hand-held card reading device. He told them that the first transaction had not gone through and asked them to put their PIN in again. In fact, the first payments were successful and went to TDM’s account. The second payment went to Flint’s personal account. Flint also took a £149.99 payment from a customer when it should have been £14.99, took payments for replacement parts and took customers’ vacuum cleaners away to repair but didn’t carry out repairs or return the cleaners. Garbett was sentenced to a total of 30 months in prison and disqualified from being a company director for nine years. Flint was sentenced to a total of 21 months in prison and disqualified from being a director for seven years. Commons was sentenced eight months in prison, suspended for 18 months. He also has to do 180 hours unpaid work in the next 12 months and is disqualified from being a director for five years. Got a story to tell? LEFT: Sandra Bayliss, Les Fisher and Barbara James cut the ribbon to open the new centre. BELOW: Barbara James receiving the 2019 Excellence in the Community award from parish councillors Mike Selby and Ed Hicklin (chair). ACADEMY HIT BY TRAGEDY l The new sports hall. PLEASE NOTE WE ARE CLOSED EASTER SUNDAY. 10am outside Melbourne Assembly Rooms where they will be given the necessary equipment and details. “Sparing just an hour of your time to help in keeping the roads round Melbourne free of unsightly litter is much appreciated,” said a society member. to have two children: Sharon and Lesley, who are married respectively to Mick Robey and Mike Unsworth. The pair also are proud grandparents to two grandsons: Samuel and Thomas. Dennis and Muriel built up the business over 38 years and were at Castle Stores until 1995 when ill health forced Dennis to retire and close the shop. They have continued to live in Melbourne, very much enjoy being grandparents, and celebrated their diamond anniversary with the family. Teacher led quality day care for babies and young children in a stimulating environment where learning is fun. PLACES Available for babies from 12 weeks to 5 year olds. Please phone to arrange a tour. Breakfast and after school clubs for children 4 - 11 years. teacher led pre school for children 3 1/2 - 5 years & breakfast and after school club for children 4 - 11 years. Village Voice April 2019 17 l Andy Gates, Mark Coyne, Ricky Sheehan and Alan Staley feeling on top of the world at the summit of Mount Snowdon. SPRING is here and a great way to enjoy the weather is a walk in the countryside. All who like to get their boots muddy and fancy a bit of fresh air are invited to join the Melbourne Footpaths Group on their next walk – around historic Shardlow and the Wilnes. The six-mile ramble is happening on April 18, although the route will be dependent on river levels on the day. All who want to join in are asked to meet at the car park on Wilne Lane at 10am. A small donation is asked for to cover insurance and maintenance work. n FUNDS to support a charity which transports blood and medical supplies to hospitals around Derbyshire were raised at an open house event by a member of Melbourne Women’s Institute. Jen Smallwood (pictured with Dave Harvey, a team member of Derbyshire Blood Bikes for many years) held the event to raise money for the team of volunteer motor cyclists who provide a courier service to the NHS, ferrying blood between hospitals, as well as medication, biological samples and even donated breast milk for premature babies. At her event, Jen sold refreshments and had a tombola stall to raise £350 for this charity. Her friends and neighbours were pleased to meet two blood bikers – travelling on their bikes – who attended what members said was a very pleasant afternoon. We are happy to welcome Steve Hogan as a new Parish Councillor for the parish of Melbourne and Kings Newton. As reported in the Village Voice, we are experiencing anti-social behaviour in the cemetery, should anyone witness any anti-social activity they should report it directly to the police on 101. Councillor Mick Usher has worked diligently to digitalise the Parish burial records, these will be available on line to view in the future. An exciting and challenging piece of play equipment has been ordered and will hopefully be in place at the Lothian Gardens in time for the Easter holidays. A meeting was held with the East Midlands Airport with a view to siting a noise monitor in Melbourne, the precise location has to be agreed due to the size and it being a permanent structure. The SDDC road sweeper was present in Melbourne recently, unfortunately due to the many parked cars in some of the streets it was unable to fully carry out its duties. The Parish Council is aware of recent issues with high winds affecting the wreaths at the Cenotaph and is working with the branch of the British Legion to find a temporary structure to display the wreaths after Remembrance Sunday. The Parish Council’s AGM was held on Thursday March 21st, the clerk and chairs of committees gave their reports, guest speakers were Steve Hollingsworth (MSP) and Steve Raine (Kings Newton Bowls Club). A film of the events of Remembrance Sunday 2018 was shown by John Madeley. We hope to show the film publicly in the near future. The SDDC has successfully prosecuted an individual for allowing their dog to foul the footpath in the Market Place. This is an ongoing issue which the Parish Council is determined to eradicate. charity. A Choir’d Taste treasurer Christine Fox and musical director Paul Marshall presented a cheque to Oliver Larkin from the Alzheimer Society. The money will be used to help dementia sufferers and their carers. A Choir’d Taste’s next concerts are on May 10 and 11 at Melbourne Assembly Rooms and will feature favourite hits from Musical Theatre including Mama Mia, The King and I, Les Mis and The Greatest Showman. MELBOURNE has been chosen as the venue to premier a new one-man show by Open Road productions. Normally Open Road successfully perform their shows in the Guildhall in Derby, but with that venue’s temporary closure for essential renovation work, they are bringing their newest production to the Assembly Rooms in Melbourne. Musical Director Phil Baggaley said he was looking forward to it. Phil has had a number of appearances in Melbourne in various guises, most recently with Ebb and Flow and previously with the Travelling People. TWO men who pleaded guilty to fly-tipping in beauty spots in Findern and near Twyford have been handed suspended jail sentences and each ordered to pay £3,084 costs. They have also been ordered to carry out 150 hours of unpaid work, which will include litter-picking. Waheed Hussain, 46, of Portland Street, Normanton, Derby, who owns Sarry’s takeaway in Cheapside, Derby, and Wahid Hamid, 39, of Fairfax Street, Derby, both appeared before magistrates at Southern Derbyshire Magistrate’s Court charged with 13 counts of fly-tipping. The court heard that Hussain had cancelled the waste collection contract he had with Derby City Council in September 2017 and instead paid Hamid between £75 and £100 per week to collect and dump the bin liners full of waste. Over the course of eight months, 139 bags were recovered by South Derbyshire District Council, although investigators say they estimate the number would actually be about 360. Ardip Kaur, the council’s legal and democratic services manager, said the council was made aware of the bags being dumped on land off Bakeacre Lane, Findern, on September 18, by a dog walker. Between that date and May 2018, scores of bags were found by the council’s environmental health team in Bakeacre Lane, Staker Lane, Arleston Lane and Burton Road, Findern. Both men pleaded guilty to 13 counts of depositing controlled waste without an environmental permit. Sentencing the pair, district judge Jonathan Taaffe said: “This is a disgraceful episode. Fly-tipping is one of the scourges of modern society. “People selfishly feel they can deposit waste on a small scale by throwing it out of a car window or by dropping things on the ground. “They do this because they are too selfish or lazy to do things properly. “This was on a larger scale where there was a clear commercial benefit and shows the attitude of someone who has little regard for other members of society.” Hussain and Hamid were each handed 26-week jail terms, suspended for a year, ordered to carry out 150 hours’ unpaid work and to pay £3,084 costs and a £115 victim surcharge. their own personally chosen acts. Melbourne’s United Reform Church holds a regular children’s group, Pilots, which meets fortnightly on Fridays from 6pm to 7.30pm at the church. Around 20 local boys and girls aged from five to 12 usually go along, and more are always welcome. Minister Marcus Hargis (back row) is pictured with some of the children. At AP Joinery we are specialists in sash and casement window repair and restoration! Have you ever thought of having your existing wooden windows converted to double glazed units? Whatever the condition of your windows... AP JOINERY will have a cost effective solution! All aspects of woodwork and home improvements. ● Kitchens ● Windows ● Flooring ● Doors etc. l The dumped rubbish in Burton Road, Findern. Commenting on the case, Councillor Andy MacPherson, chairman of environmental and development services at the district council, said: “We welcome Judge Taaffe’s comments. We will not tolerate fly-tipping in South Derbyshire. “Fly-tipping is a deliberate and thoughtless act that blights the environment, is a danger to wildlife, is a source of pollution and a danger to public health; it undermines legitimate waste businesses. “Failure to properly dispose of any type of waste is simply not acceptable and, as this case shows, we will take action against anyone caught.” Last month we reported how residents along Arleston Lane were campaigning to prevent “unsavoury” behaviour along their country road, including fly-tipping. "a reputation builtt on local recommendation"
Contact David on . . .
Minibus trips Monday 13th May to Bakewell leaving Melbourne at 9am, cost £10 per person. Thursday 30th May to Solihull Leaving Melbourne at 9am, cost £10 per person. Meet friends... bring friends... make friends. area and the wider East and West Midlands. The two-mile fun run attracted over 100 runners and It was great to see so many children from the local primary schools of Weston, Aston and Barrow competing – especially as most of them were beating mums and dads over the line! As ever, an amazing team of volunteers did a sterling job marshalling the course and field and cooking up a storm, providing plenty of hot drinks and sausage and bacon butties. Thanks must also go to the Ukrainian Centre at Weston for making their site available for the start and finish and, also new this year, the use of their large hall which provided the excellent kitchen facilities and somewhere warm and dry for runners and spectators. The event, now in its 29th year, was organised by 107th Derby Scouts (Aston, Weston and Shardlow) and early indications suggest that it raised around £1,400 for group funds. This will go towards equipment and activities for the busy and increasing membership aged from six to 18. NEW leaders are being sought to help take Melbourne’s successful football club into its next chapter. Last year Melbourne’s two football clubs, United and Dynamo, merged for the first time to form one large organisation, which now has around 350 players going from age three up to an adult first team competing in the Midlands Regional Alliance. Melbourne Dynamo’s current chairman, Mark Jackaman, is stepping down from the role after three years, as is vice-chairman Nigel Theobald – but a strong committee is in place with other key roles occupied by experienced volunteers. Now the club is looking for new leadership to take on the co-ordination of the busy and successful set-up, which now has four adult teams, 16 junior teams and a soccer school with young players coming from as far afield as Etwall and Chellaston to learn the skills of the beautiful game. of facilities made possible thanks to the Melbourne Sporting Partnership. So, has he enjoyed his time as chairman? “I certainly have. It’s a fantastic club. It’s been exciting to have been involved during such a transitional time for the club,” he said. “I’ve just finished my 10th year of managing one of the teams. I started the under-8s with my lad Sam, now it’s the under-18s. And I’ve been chairman for three years alongside Nigel, who has worked tirelessly to make things happen behind the scenes!” The club will hold its end of season ‘Registration Day’ at the MSP on Cockshut Lane on Saturday, June 8. Anyone interested in the roles of chairman or vice-chairman would be asked to fulfil the role for a two-year term following the club’s annual general meeting in May. Phone Mark on 07967 694198 for more details. © 2019. An independent community paper designed and published by Village Voice Newspapers. Typeset by Greenborough Ltd., t/a Voice Productions. Printed in England. The publishers of Village Voice are not responsible for any content or claims in advertisements. Artwork not supplied by advertisers may not be reproduced without the written permission of the publishers. The use of this or previous editions of Village Voice for marketing or canvassing of advertisers is strictly prohibited. pleting the scoring. Melbourne Dynamo Sunday first team began March entertaining top of the table AFC Vine and, despite an early Jack Searcy header, they went down 3-1 to two late goals. A good 4-2 away win versus Golden Eagle was thanks to a stunning Brad King hat-trick plus a close range header from skipper Paul Lakin which earned Dynamo the points. A 1-0 home loss to Etwall Rangers was soon forgotten as Melbourne ended the month with a 2-0 home win against Golden Eagle with Harry Foxon and Josh Burton getting on the scoresheet. Melbourne Dynamo Sunday Reserves played only two games in March; the first was a 2-2 draw away to Corinthians as Joe Dale and a rare Sam Adcock finish earned a point. A 4-0 win versus Willington was thanks to doubles from Brad King and Joe Dale to give Melbourne a much- deserved win. LOCAL companies are being asked to lend their support to a charity bike ride raising vital funds for the Anthony Nolan charity, in memory of a young doctor who died aged 26. The 94-mile bike ride from Melbourne to Cambridge is now becoming an annual event, and it is held in memory of Dr Sophie Miller, who lived locally. Sophie, who studied at Cambridge University, died of a blood disorder and the fund-raising ride in her memory is taking place on June 1. Over the past two years that the ride has taken place, more than ÂŁ13,000 has been raised for Anthony Nolan. Local people have also supported by offering accommodation for cyclists, as well as sponsoring and promoting the event. Residents of Melbourne are being asked if they would consider supporting the event by offering their companyâ&#x20AC;&#x2122;s sponsorship. To offer support, you can visit this website: https://www.justgiving.com/fundraising/teamsophiecycle or call Sophieâ&#x20AC;&#x2122;s family on 07442 169145. Village Voice deliveries Weston-on-Trent For several years the Village Voice newspaper has been delivered to your home but unfortunately the person is unable to continue. We thank them for all the help and support they have given during this time. Volunteers have kindly stepped forward to deliver to some areas of Weston, but currently not all of the village has its own Village Voice delivery person. We are very keen to continue to provide all residents of Weston-on-Trent with their free monthly copy and wondered if anyone could help with this please. The papers would be delivered monthly to your doorstep in a waterproof bag. If you are able to help please phone... Tina Baker 07523 239 487 for more details. Thank you. WOMEN tennis players from Melbourneâ&#x20AC;&#x2122;s flourishing club will be playing in division three of the Derbyshire Summer league this year, having won division four last season. The tennis players above from Melbourne, Emma Guest, Sallie Allen, Carolyn Crocker, Karen Brenchley (captain), Pam Oliver, Marjorie Tunnicliffe and Pat Milham were pictured at a Lawn Tennis Association dinner at which around 160 people from Derbyshire clubs attended. YOUNG cross-country runner Florrie Mitchell from Melbourne Junior School is already officially the fastest girl of her age in South Derbyshire – and she did the area proud in a national race in March. The national cross-country event took place in Loughborough and saw more than 2,000 young runners from across the country take part. Among them was Melbourne year six pupil Florrie, 10. Florrie had already won the regional final, putting her in first place for South Derbyshire within her age-group, and came in the top half of year six runners on the day, being placed 147th out of nearly 400 of her age. She completed the 2,200 metres in nine minutes and 38 seconds. The winning girl did the distance in seven minutes and 34 seconds. GOING UP ... Melbourne RFC’s first team celebrate their win over Newark, and promotion to the first division next season. dating second row pairing, Euan Holden returning from injury, Joe Livesey returning to fullback and Stuart and Hancock on the wing, the game started decisively with plenty of physicality from both sides. Taking an early lead of 12-0, Melbourne’s line-up changed with Ben Dickinson entering the backline following an injury to Oliver Page. Sam Hancock reverted to scrum half at the same time, immediately making his presence felt by taking the scoreline to 19-0 at half-time. Newark remained strong in the second half and, throwing everything they had at Melbourne, saw the scoreline change to 22-5. But Melbourne responded by persistently attacking the away team’s defence line, and the next try went to Melbourne (Saffel, converted by Holden). Building on the ruthlessness, patience and discipline developed throughout this season that has seen them claim victories and bonus points at the final stages of games they’ve played, this fixture was no different with Ben Dickinson taking the final scoreline to 41-5 in the closing minutes. The result sees Melbourne claim the Midlands 2 League title at the first attempt – a great result after a sour end to last year’s season when a points technicality saw them relegated. The following week, Melbourne showed their grit and determination with a further away victory over Ashbourne (22-29) where, despite having showed rare weakness in the first half, they clung on to claw their way back to a win. The club’s Academy competed against Ilkeston, Paviors, Long Eaton and Dronfield in the Derbyshire Colts Transition Festival at Long Eaton RFC on March 30. The Melbourne team won two and lost two, but as the festival was decided on tries scored, the Academy were only denied outright victory by Dronfield, who equalled the Green and Gold’s 11 tries total. Tries for Melbourner came from: Will Flint, Michael McCallum (two), Matt Suddaby, Thomas Watson (three), Dylan Kocher, Ben Woodhead, Jamie Rudd and Matt Harris. The club would like to congratulate all the lads who worked hard playing 15-a-side like sevens rugby, John Cooke-Rogers for the guest coaching and special thanks to Academy Physio Lauren Broome for patching everyone up, feeding the lads (and coaches) Strawberry Laces and for dealing with some serious opposition injuries. March saw a more mixed picture for the club’s younger sides, with the under-15s losing to Market Bosworth and Mansfield, but also claiming a 26-35 victory against Matlock in a friendly on March 24.